As you may know it is widely hypothesized that quantitative easing has contributed to the rise in asset prices the past couple years. Here is that in pictures. 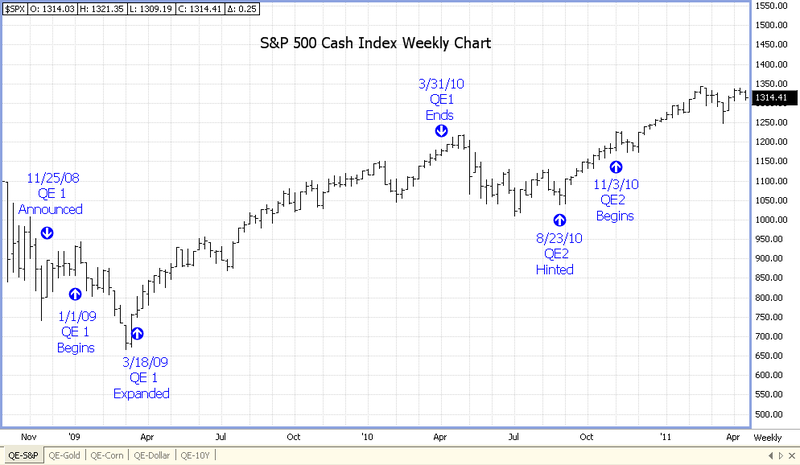 I think in the near-term any QE3 would probably more than likely continue to lift assets. I find now that getting a grasp on major economic trends locally and globally can make industry and equity selection much easier as well. As any QE continues stocks and commodities will rise especially metals like gold and silver. Same dance, only a new song. 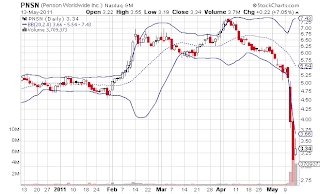 Last week Penson Worldwide (PNSN) a major international clearing firm and the second largest clearing firm in the U.S. came out about $42 million that might bring a write-down. A board member who had a relationship to the $42 million resigned. Immediately following this news the stock crashed from $5.00 to $2.73 a share in two days. Although the $42 million seems significant it is only a measly 0.49 percent of their $8.7 billion in average daily customer balances. Penson also has more than $5.8 billion in cash and equivalents. They even had a pretty good recent quarter. In their last quarter revenue was up. I don't see this development seriously damaging their long-term business. In-fact with a market cap now of around $100 million I see this as an attractive valuation. Although this is an opportunity there are things to keep in mind. Over recent years their revenue growth has declined slightly and they aren't consistently profitable. Overall, I think this is a more speculative play but I think there is a good setup for a small position here off what appears to be some capitulation and technical strength. The price action looks like the beginning of a bullish engulf. Buy volume needs to stay steady for this to continue. I like an entry point on price strength above Fridays close. If the stock doesn't follow through here, however, I only want to watch and see how the technicals develop. I have been writing a lot about macro trends from monetary metals like gold and silver, oil to rare earth element stocks. Outside of the precious metals I haven't included that many individual stock picks. So, today I'm going to look at a couple of stocks. 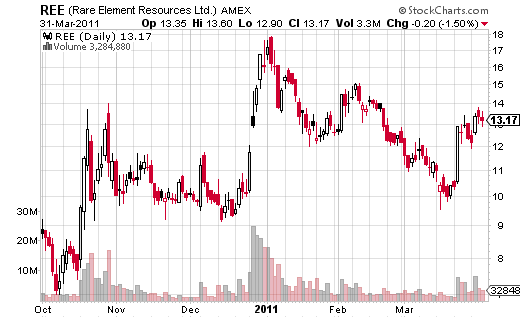 Rare Element Resources (REE) mines for rare earth elements and gold. REE has a market cap of only $568 million at yesterdays close of $13.17 a share. Their Bear Lodge property looks to have a substantial amount of rare earths. I think this major is a good addition or alternative to other majors like Molycorp (MCP). If you are interested in rare earths here is some information from the US Government Accountability Office on rare earths in the defense supply chain. One interesting tidbit from the report is that once a company gets the capital to begin a mine it can take from 7 to 15 years to get a property fully online due to regulatory procedures. This next stock is currently my favorite setup at the moment. It is a natural gas company called Union Drilling (UDRL). While there is roughly $200 million in net tangible asset value and only a $237 million market cap I'm more interested in the chart play. The $10.40-$10.50 area has become a resistance level and as it stands today it is still consolidating around these levels. This is bullish consolidation currently and I see UDRL heading higher if it can print $10.61. I expect a significant move higher either today or the next couple trading days. I believe that a top down approach continues to be one of the best strategies in this current environment. I want to continue to look at the oil and gas drillers, commodities and the precious metal miners. The writing has and should continue to be on the wall in regard to these areas outperforming. I want to talk a little about the macro situation in this article. 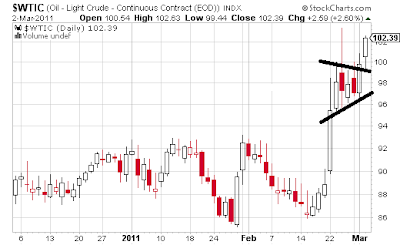 More importantly I want to share my thoughts on crude oil at the moment. I also have a silver stock that looks interesting. 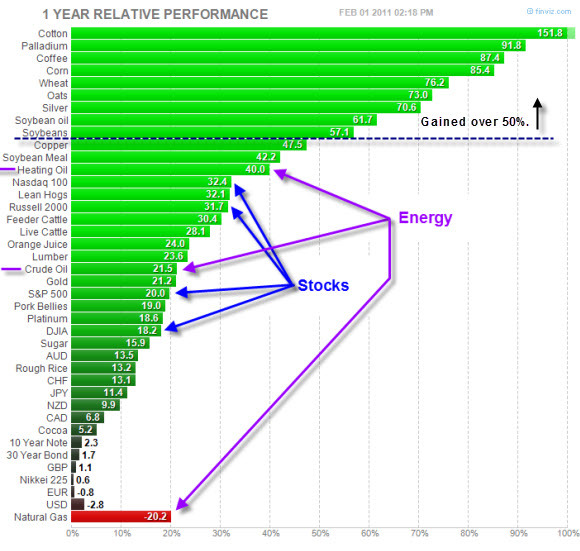 I won't go deep into the thesis behind the bullish case for commodities because I talked about that before. I still think it is important to be allocated in hard and soft commodities at this time. There is going to continue to be "dollar" inflation and this should allow certain assets like stocks and especially commodities to continue higher. It's essentially a Cantillion Effect. The rise in prices we have seen across the board really can't be totally explained otherwise. 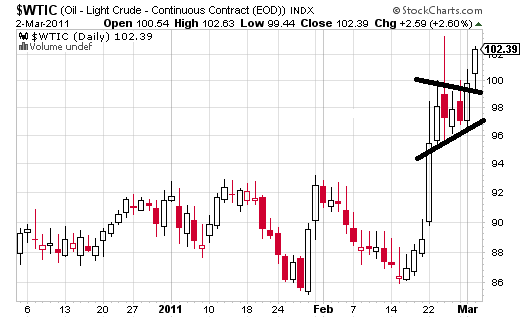 Oil looks particularly bullish fundamentally and technically still. In the big scheme of things it won't be good at all if oil takes off like it did in the 70s or 2008. Some of you probably know the story from the late 70s but if you don't there was a severe oil crisis. There was also very significant inflation that was only struck down by Paul Volcker getting interest rates up to a whopping 19%. This saved the dollar but it also brought a recession. Oil has gotten particularly volatile lately. Part of this is uncertainty about supply following the revolutions. There was a news story about what might happen if Libya and Algeria shut down supply. Technically, there has been some congestion following the big spike day. It looks like bullish consolidation. It's starting to be confirmed as there was just a pop out of it. 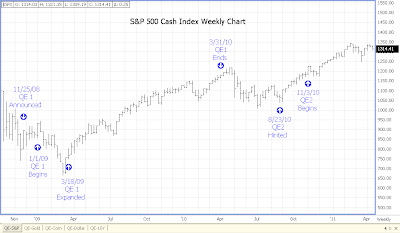 If we continue hitting new highs I think there may be some more explosive momentum. There definitely is more upside. As far as holding oil for any time period the best instrument is the futures themselves (CL). The US Oil Fund ETF ticker (USO) is a terrible way to play oil. It's because of the way the contracts roll. The ETF must buy oil futures contracts and sell them before expiry. As a result there is decay in the ETF. 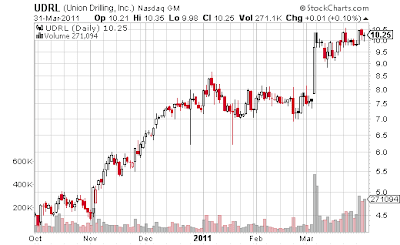 The natural gas ETF (UNG) is a good example of the dynamics of these ETFs. Natural gas has been pretty flat but the ETF has performed even worse because it bought the expensive monthly contracts and had to sell them cheaper right before expiration. I think United States 12 Month Oil (USL) holds longer contracts than USO. USL has outperformed USO over long time frames. Teucrium WTI Crude Oil Fund (CRUD) is also another alternative as it tries to buy contracts on three different maturities to offset decay. Here are some ideas in the mining sector. As silver continues hitting new highs I like this Canadian junior miner Aurcana Corporation (AUNFF) here. 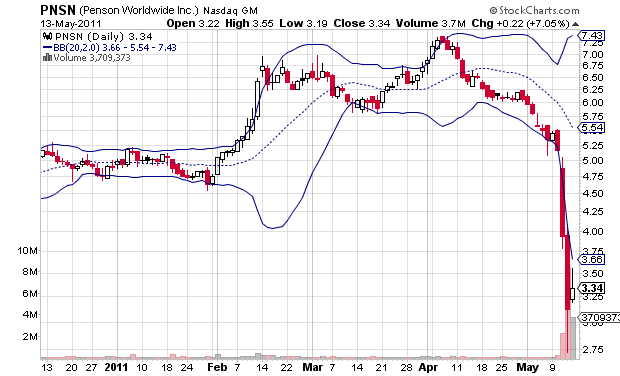 It's a smaller company and in the penny stock range. Some other larger market cap names that are worth a look include Hecla Mining (HL), Silver Standard Resources (SSRI) and Pan American Silver (PAAS).